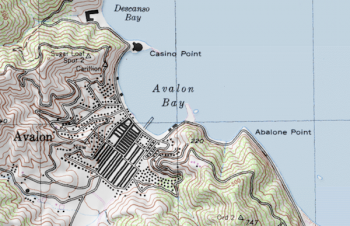 Casino Point, Santa Catalina Island is a 20th century name for the point at the north end of Avalon Bay. It's name was coined when William Wrigley, Jr. built the first casino, Sugarloaf Casino, at the location to serve as an entertainment and gathering place for the island’s visitors. He soon realized that the building was too small to accommodate the growing visitation to the island. In early February of 1928 the Sugarloaf Casino was torn down and construction of the new Casino began. The replacement casino, built under the direction of William Wrigley, Jr. and David M. Renton, built, cost of $2,000,000 at the time. Architects Sumner A. Spaulding and William Webber designed the building at Mr. Wrigley’s request, with a ballroom over a movie theatre in the Moorish Alhambra style with Art Deco fixtures, furnishings and artwork. The construction of the building lasted 14 months with crews working around the clock. Artist John Gabriel Beckman was commissioned to decorate the interior of the theatre and the main entrance foyer with extensive murals. The theatre was originally built to accommodate 1250 moviegoers and was one of the first theatres in America retrofitted for both silent and sound motion pictures. The theatre’s organ was installed, along with 16 ranks of pipes (73-85 pipes per rank) in the ceiling lofts of the theatre. Today this organ is one of only four working pipe organs in the world. The ballroom was designed and built with a cantilever construction that made possible an expansive circular dance floor without supporting pillars. A soda fountain, known as the Marine Bar, was built and a beautiful circular terrace surrounding the ballroom added a finish touch. The end result was a landmark that remains an architectural wonder and continues to serve as a place of entertainment for residents and visitors. This page was last edited on 18 June 2016, at 18:57.